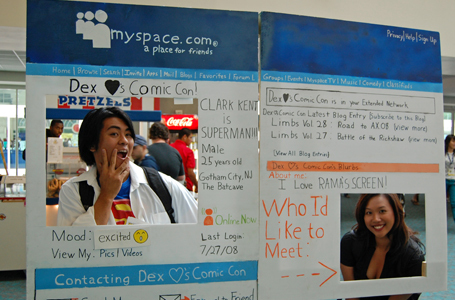 If I had to award one costume from Comic-Con as the most entertaining, it would go to Dexter and his tribute to MySpace. I literally laughed out loud when I saw Dexter coming around the corner in his costume because it was so original and well thought out. In fact, when I asked if I could take a picture of him he insisted that I be in the photo with him. I honestly didn’t know what he meant until he unhooked the back of his contraption and he swung out the “Who I’d Like to Meet” window – how creative is that?!? Even more entertaining, I read at Rama’s Screen that a guy that actually works at MySpace took a picture of Dexter to share with Tom. I can only imagine what Dexter has planned for next year’s Comic-Con! Dex and I were College classmates and he’s always been the more excited and creative one. I’m glad you got the chance to take a picture with the man who rocked the Con house with his myspace costume. @Jessica: It was so much fun, you had to be there! Oh my! that is absolute GENIUS! hahaha I love this so much! I can’t wait to see what Dexter’s costume is going to be this year. :] Too fun!